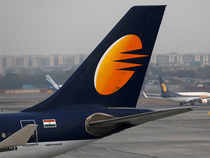 NEW DELHI: Shares of Jet AirwaysNSE 10.22 % (India) jumped 12 per cent in Monday’s session after it was reported that founder and principal promoters Naresh Goyal, and his wife Anita Goyal stepped down from the board today. An ET Now exclusive suggested that Naresh Goyal and wife Anita Goyal have quit Jet Airways board and the company is likely to notify stock exchanges shortly in this regard. As per the sources, Jet lenders are to give names of new appointees later and government’s approval will follow lenders’ recommendations. Now, lenders’ stake in the company stands at 50.5 per cent and Naresh Goyal’s stake was reduced to 25.5 per cent from 51 per cent. The Abu Dhabi carrier Etihad’s stake in the company gets reduced to 12 per cent from 24 per cent.